“It's our understanding that they went on throughout 2016," Giuliani told NBC's Meet the Press. Giuliani said there "weren't a lot of them, but there were conversations. Can't be sure of the exact date." "Probably could be up to as far as October, November — our answers cover until the election," Giuliani said, referring to written questions Trump has answered from special counsel Robert Mueller, who for 20 months has been investigating Trump campaign ties to Russia and whether Trump, as president, obstructed justice by trying to thwart the probe. "So anytime during that period they could've talked about it," Giuliani said. "But the president's recollection of it is that the thing had petered out (subsided) quite a bit,” and the construction project never materialized. During the early stages of the 2016 race for the Republican presidential nomination, Trump often said he had no business ties to Russia. 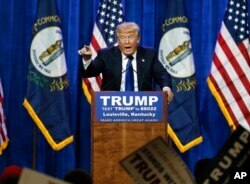 FILE - Then-Republican presidential candidate Donald Trump speaks during a rally in Louisville, Kentucky, March 1, 2016. At the time, Trump was telling voters he had no business dealings in Russia while his personal lawyer was negotiating a Moscow 'Trump Tower' project through the November 2016 election. 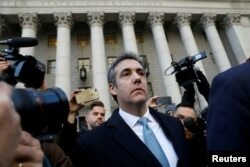 Giuliani, a former New York mayor, said that Michael Cohen, Trump's former personal attorney, "would have a much better recollection of [the Moscow negotiations] than the president. It was much more important to him. That was his sole mission. The president was running for president of the United States. So you have to expect there's not going to be a great deal of concentration on a project that never went anywhere." FILE - U.S. President Donald Trump's former personal lawyer Michael Cohen exits Federal Court after entering a guilty plea, in New York City, Nov. 29, 2018. The online news site BuzzFeed said last week that Trump had directed Cohen to lie to Congress about the Trump Moscow timeline, but Mueller's office late Friday said the report was "not accurate." BuzzFeed said it continues to stand by the story.